January 15th, 2012: Bronwyn was 14. I was 48. 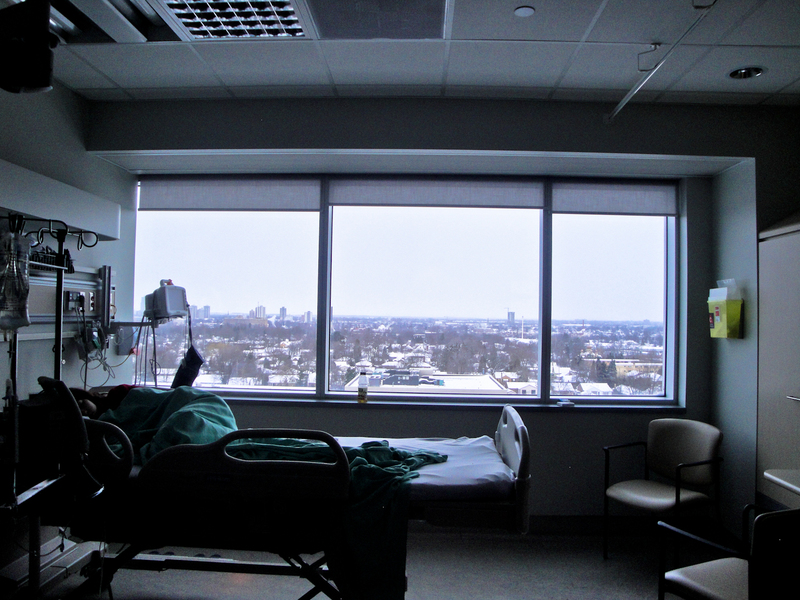 We were in a hospital room in the Children’s Hospital in London, Ontario. We had been airlifted from the hospital in our hometown, Thunder Bay, Ontario two days before because a routine blood test run by our GP found reason for Bronwyn to be tested for leukemia. We had been ripped out of our lives, literally. I was at work on the morning of the 13th. Bronwyn was at a curling competition watching her team play without her as she was too weak from a persistent cold but was determined not to miss it. I got a phone call from the hospital telling me they were waiting for Bronwyn, I assumed, to do tests. Our GP had sounded baffled on the phone the night before while he stammered out to me that my daughter need to be tested, [I later discovered why. A GP will discover a case of childhood cancer once every ten years on average. Usually it is a specialist or ER doctor] so I was expecting that call just not so soon with such an urgent message to get to the hospital ASAP. By the 15th we had been at the Children’s Hospital for two days the the urgency of the situation had worn off. The only symptom she had was a general weakness. I was convinced the tests would show something else was going on like mono, which is not a great thing to have but when compared to cancer, fantastic. We knew there would be a test of some sort on the 17th. That is what we were waiting for, for Tuesday. Barry and Sinead would be with us by then, taking time away from work and school. Bronwyn and I were enjoying a visit from relatives who lived in the area when the doctor walked in to Bronwyn’s hospital room with two colleagues saying they had a diagnosis. I was stunned. I wasn’t prepared. I was waiting for Tuesday. It was cancer. Acute Myeloid Leukemia. AML. I clutched my knees and bent over like I had been punched in the gut. I sucked in air and looked up at Bronwyn sitting in the bed. She was wearing a new pair of bright, pink, plaid pjs with a lost look of pain on her face. I felt tears stinging my eyes but it was not the time to break down. There was more to hear from the doctor. I went to Bronwyn, put my arm around her and pressed my forehead to hers. It was just a moment, a few seconds, but in that time we bonded, became one in the fight. We turned to the doctors to face, together, what was to come. There are no words to fulling communicate what kind of hell chemo is. You sign your kid up for torchure, because it is the only option given, and you roll the dice. Will it work? Will it cripple your child? Will it kill her? All were possibilities. If the cancer doesn’t get her the chemo sure will try. I rode on a wave of determination and shock that pulled me along for the first few weeks and then Bronwyn’s hair started to fall out and fall out fast! Bronwyn didn’t care. On the day of diagnosis she declared she didn’t like her hair anyway. I didn’t really care about her losing hair either. I had always had a casual attitude towards hair and the girls knew they could do whatever they wanted to it. Hair grows back. It can be fixed. Cut it. Dye it. Shave it. I don’t care. But, Bronwyn’s hair on her pillow, on her brush, on the towel, in her hand, meant this was real. This was really happening. My daughter had cancer. Life had stopped for it. The past meant nothing. The future was a blank slate. The present was a nightmare and I couldn’t escape it anymore. It. Was. Real. A package had arrived from my sister a week earlier with a skein of Handmaiden wool, Ottawa, in a blue-green variegated. I dug it out, pulled up Clapotis on my laptop and cast on. With every stitch I felt the tension slowly drain away. 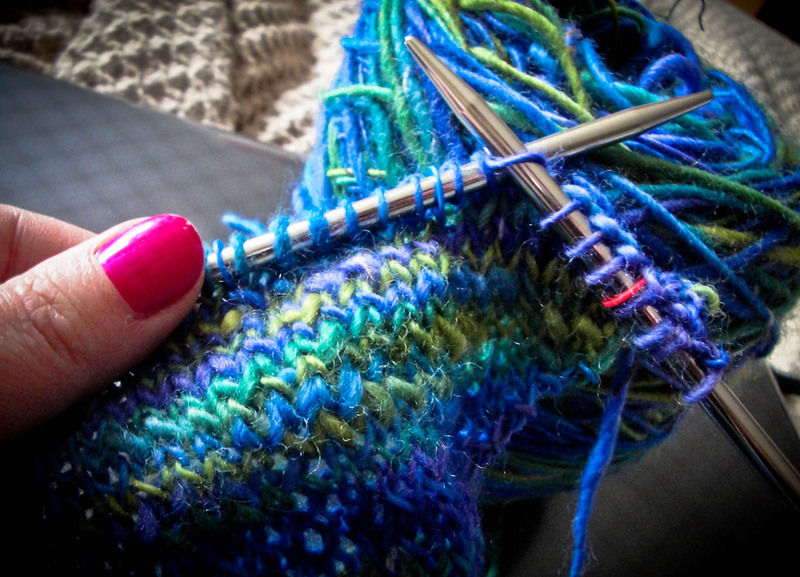 Life looked a little more manageable with yarn the colour of calm slipping through my fingers. That scarf became my best friend. I carried it around and pulled it out every chance I got which isn’t as often as you might think. 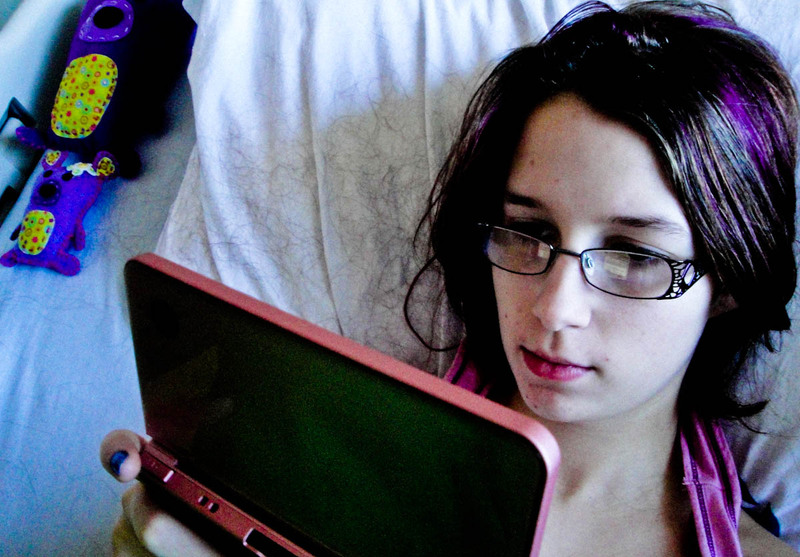 Helping your child through chemo is demanding and stressful to the point of paralyzing. It took a month but it got done. 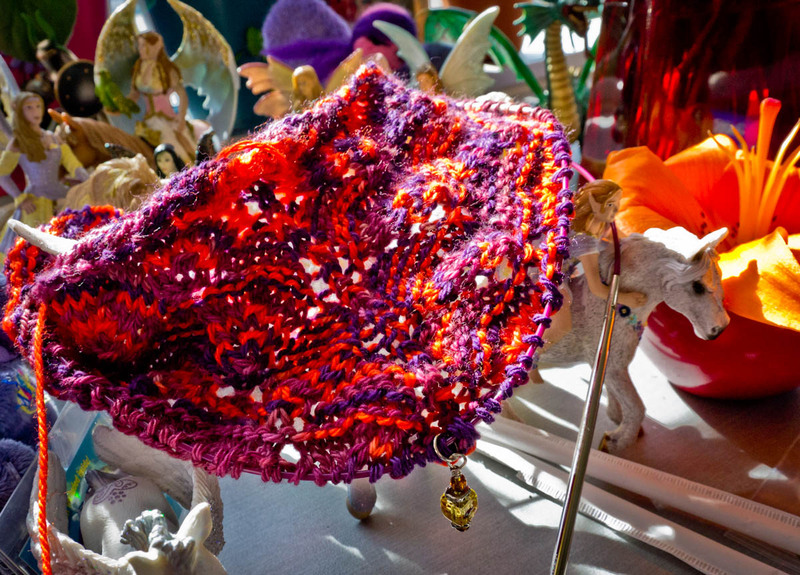 By the time I was finishing the last few rows of the Honey Pot shawl Bronwyn was done four months of treatment, most of it spent in the hospital. She was recovering from from her last round of chemo when she suffered heart failure…… as a result of the chemo. 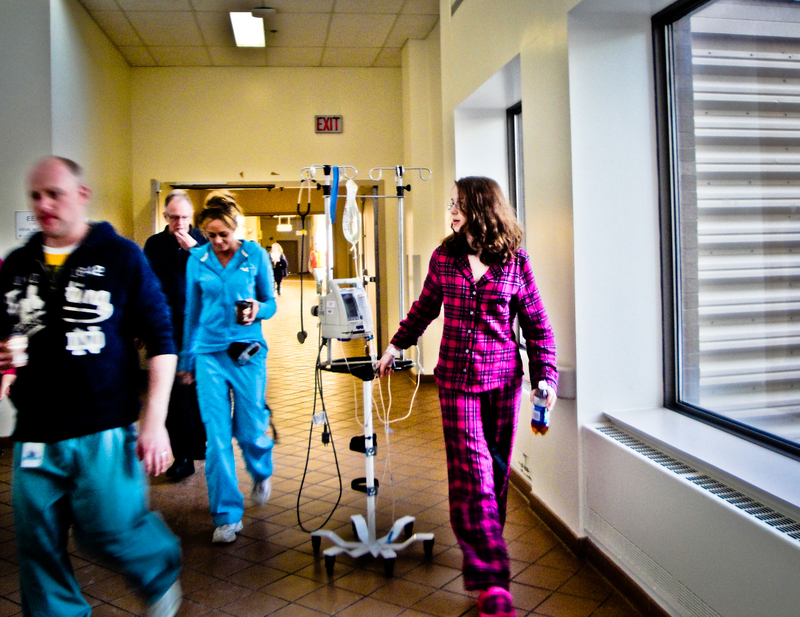 She was airlifted to Sick Kids in Toronto with 20% heart function and low blood counts. She was cancer free and dying. A new chapter in her journey was just beginning, a chapter for another post. Knitting had got me this far and it would continue to comfort me through hopeless times. 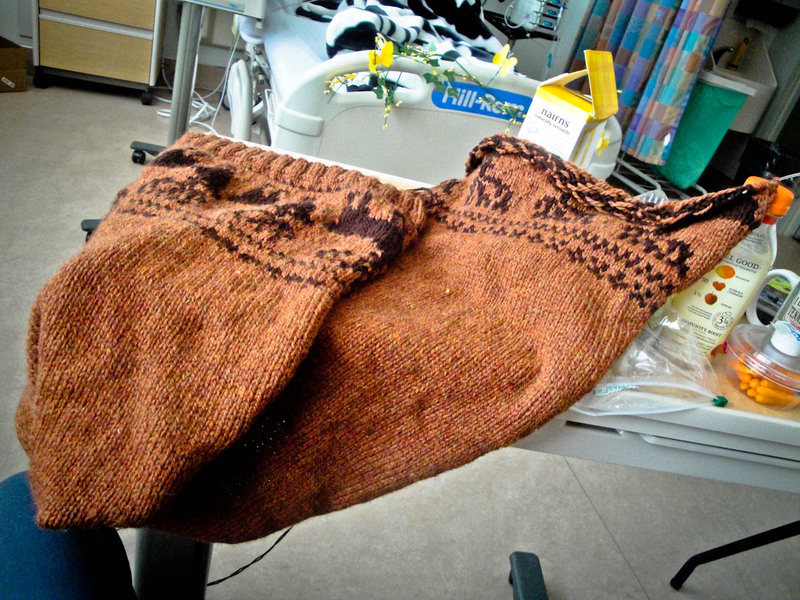 This entry was posted in story and tagged AML, cancer, cardiomyopathy, chemo, childhood cancer, Children's Hospital, heart failure, hospital, knitting, pediatric cancer, yarn by GoldenCancerMom. Bookmark the permalink. Wow. I’m almost at a loss for words. Thank you very much for sharing your story. I can hardly imagine what you’ve been through. I’m in awe of the personal strength of your daughter and you. 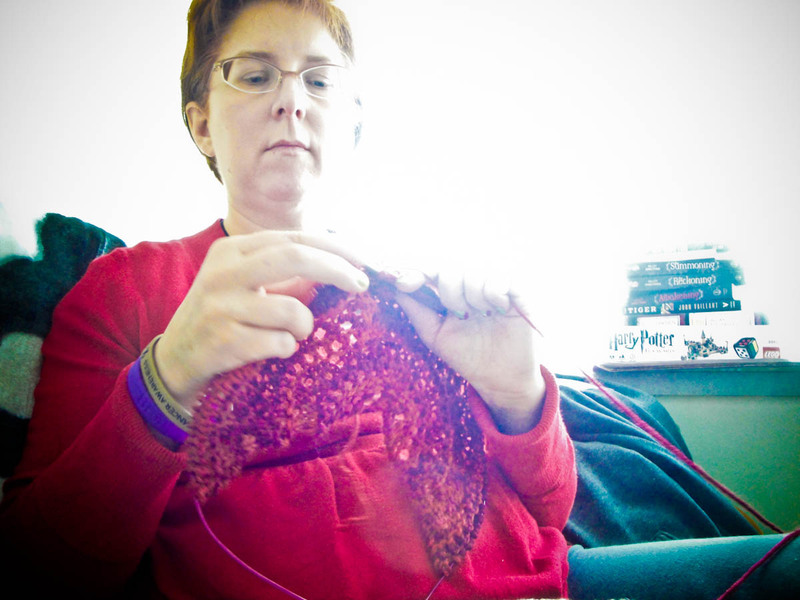 Knitting helps me ease stress too. I think it’s wonderful you had that to comfort you, if there was any comfort to have. I haven’t read your other posts yet, but will.